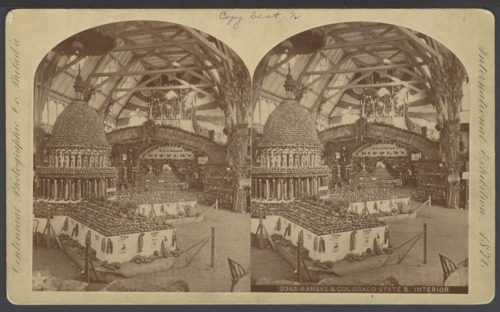 This is a stereograph showing the Kansas State Exhibit at the National Centennial Exposition in Philadelphia, Pennsylvania. The forefront of this photograph shows agricultural produce in the shape of the Topeka Capital building. In the background, one can see an 'Atchison, Topeka, & Santa Fe Railroad Display' banner.